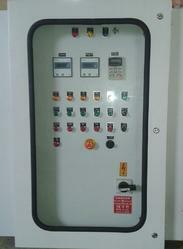 Leading Manufacturer of industrial control panels from Pune. We manufacture all types of Industrial Control Panels like motor starter panels, MCC Panels, PCC Panels, VFD Panels, APFC Panels etc. The quality of our product is world class and we gaurantee client satisfaction in terms of panel quality, aesthetics, workmanship and sound electrical logic and control. We use the latest panel accessories available in the market for all our panels. Our lead time for supplies is exceptionally low.